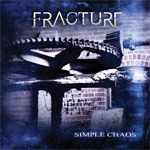 Simple Chaos might be an odd, and uncharacteristic, name for Australian metal band Fracture's debut work on Nightmare Records. There's nothing really 'simple' about this disc of progressive metal, and it's hardly chaotic. Coming from the minds of two men, David Bellion (v) and Tony Markou (g), Simple Chaos shows some creativity and experience beyond the band's short existence. The arrangements within are deft, diverse, and intriguing. Unlike so many progressive metal bands, particularly in Europe, Fracture doesn't depend solely upon a foundation of power metal. Yeah, no kidding (even though it is there, in parts, throughout). Nor does Fracture sound like some clone of the well-recognized Dream Theater, Symphony X, et al, though indeed the influences are there. The musical canvas of Simple Chaos is used quite well, with creativity and diversity. Songs like Simple Chaos and Without End can move between moments of foreboding intensity and swirling melancholy. If you expect your progressive metal to push the limits of twisting time signatures and plucky instrumental pivots, then Simple Chaos will exceed your expectations. Rearranged and The Killing Kind are prog of this sort, most ambitious and captivating. However, if your expectation leans to the ear-friendly, catchy, and accessible side, this work will probably have you more than a little confounded. While the compositions are blistering and bursting with ingenuity, nothing truly lifts this work or simply stands out, except for that impressive ingenuity that makes progressive music, well, progressive. This hardly makes Simple Chaos a 'bad' work, only one that expects some intelligence and patience from the listener to be well appreciated. Listen with reasonable expectation and you will be rewarded. Aussie metal band Fracture debuts with a solid work of progressive metal on Simple Chaos: a work that is intelligent and creative, but requires patient listening to reap the inner rewards.